MainAll NewsInside IsraelHow much does an illegal gun cost? How much does an illegal gun cost? In a sting operation, which has already captured more than 62 criminals, an undecover cop reveals what it takes to get an illegal weapon. In a sting operation, a policeman went undercover for a year, learning the intricate underworld of illegal arms trafficking along the way. This morning, more than 600 policemen worked to round-up the uncover weapons dealers, arresting 62, with more expected throughout the day. Before the morning's operation began, the undercover agent was presented with a pistol and a certificate of commendation in a ceremony by Internal Security Minister Gilad Erdan, Police Chief Roni Alshich, and Central Police Commander Moti Cohen. 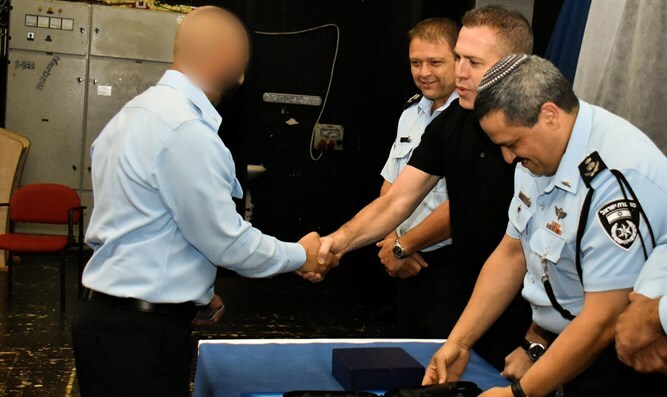 "I salute this courageous agent," Erdan said at the ceremony, "who uncovered an entire weapons trafficking network tonight, and [I salute] the Israeli police force, who joined in this operation. The fight against illegal weaponry is a top priority for the police and for me, and we will continue [fighting] with every tool available until we eliminate it." Alshich added: "Not every policeman merits, from the very start of his service, to give such a significant contribution to the abilities of the Israeli police. This is an opportunity to thank him for his decisive, courageous, and professional action." During the months of his investigation, the agent bought 12 improvised Carlo submachine guns, 3 Kalashnikov assault rifles, 2 improvised M16s, 4 pistols, a stun grenade, ammunition, as well as more than 9 kilograms of hashish, more than 700 grams of hydro-marijuana, and 85 grams of cocaine. During his operation in the "triangle area" (between Tayibe, Kalansawa, and Netanya) and Netanya, the agent became a popular figure in the criminal world, and was often called in by his "friends" to reconcile conflicts and disputes. Shortly before losing his cover, the agent recalled his recruitment process: "I always saw myself on the side of upholding the law, when I was asked to work as a double agent I didn't think twice. It's a challenging task. The weapons situation in the Arab sector is a tremendous problem for the residents, it's a dangerous situation which I know from personal experience."